Good morning, dear friends. I thought I’d drop in while husband is at the shop trying to scrounge up work for the day. One of the easiest and most fun layout designs to play with is a grid design. I find the linear design and clean lines really appeal to me, so when I come across a good grid design, I jump on it. In ways, this layout is a sister layout to my Classy and Fabulous page. In this one, both my daughters have their sunglasses on- inside the house. They’re also both wearing bright, cheery and summery clothes. In essence, they’ve really created their own sunshine (hence the title). 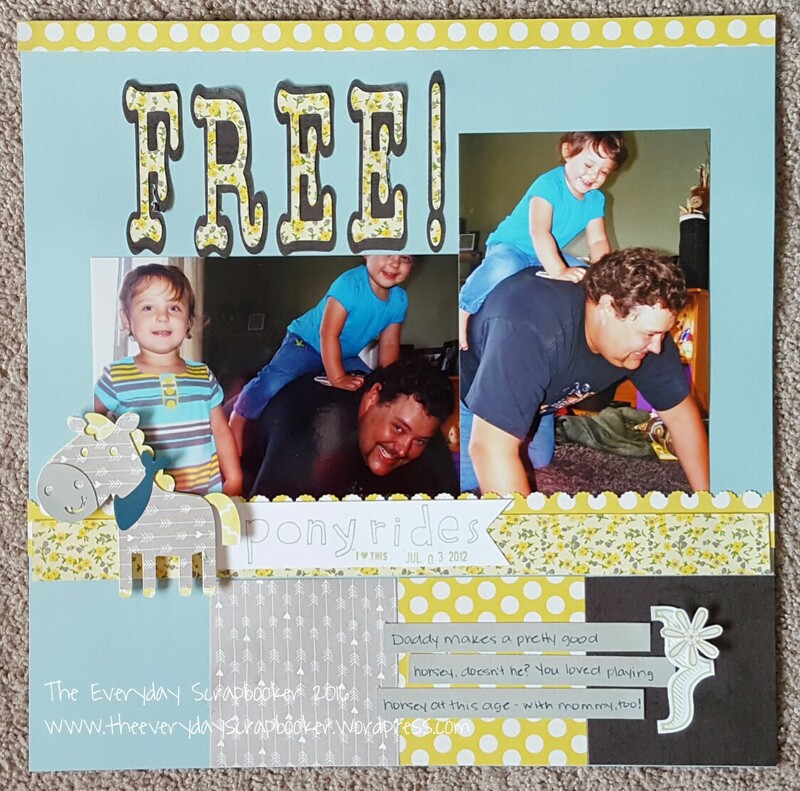 I used very little CTMH on this page, opting instead to use EP and MME to help drive home the sunshine theme. 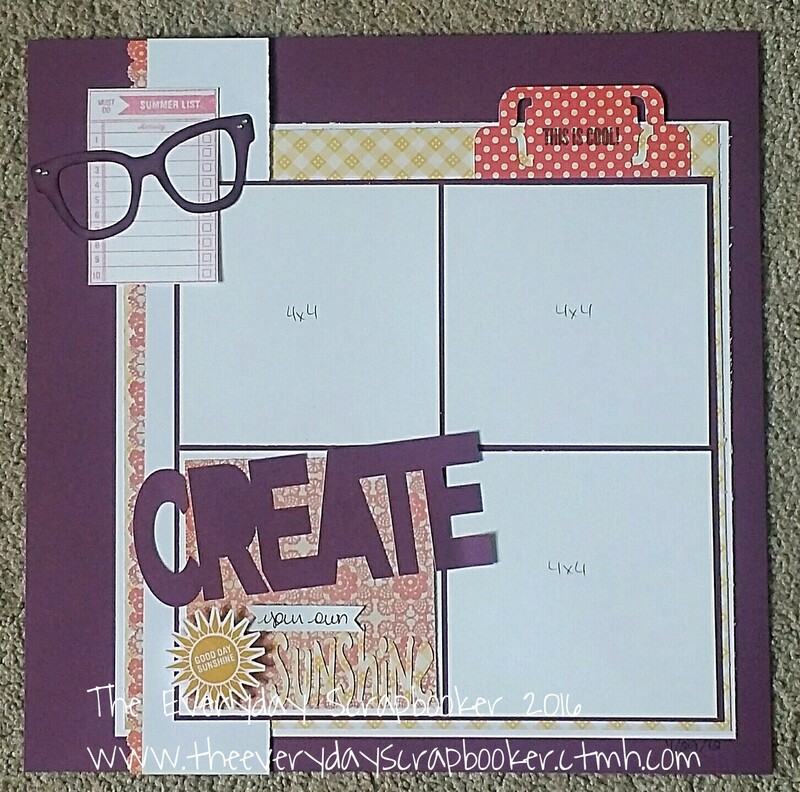 The sun and checklist you see were stamped with various CTMH stamp sets (and inks), while the title, glasses and tab were cut with my cricut. I added some bling to the glasses by adhering clear rhinestones to the corners, giving them a retro/vintage vibe. As always, I began my creative journey using a sketch I found online. How do you start your creative process? Do you search for inspiration first, or do you use your own brain power? Enjoy your Thursday. I’ll be back again real soon with more layouts! It isn’t often I scrapbook anything about myself. It’s equally as important as scrapbooking my kids and family. My kids and grandkids should know who I am, too! When I saw SG’s challenge to create a layout recording 17 of your favorite _______ (blank), I knew songs would be a great option. I absolutely LOVED this layout concept. 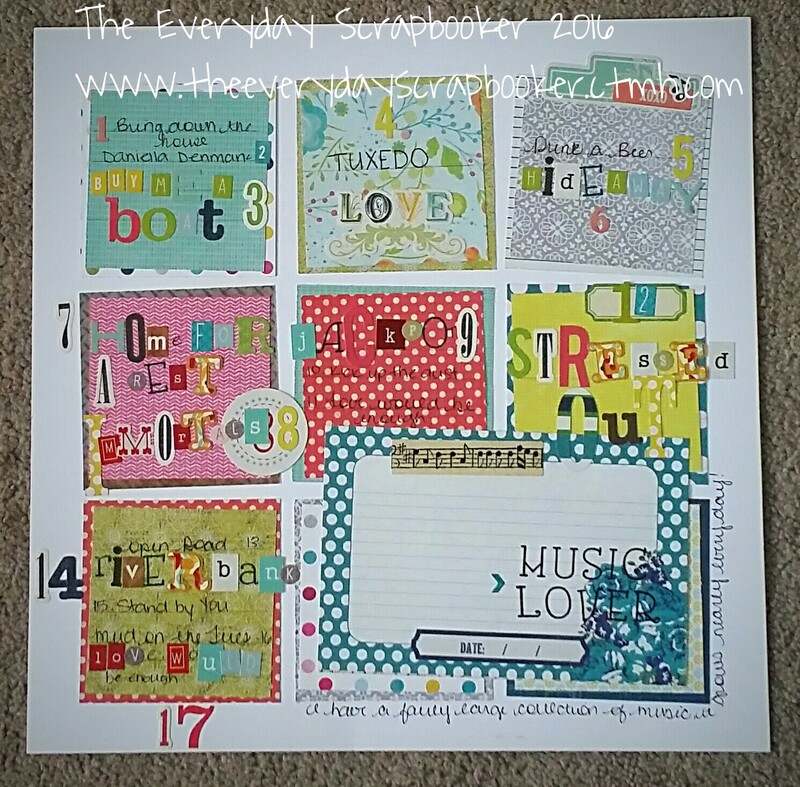 I used up some (of a myriad) letter stickers in my stash to create the numbers and song titles on my layout. For variety, I also wrote by hand some of the titles, too. 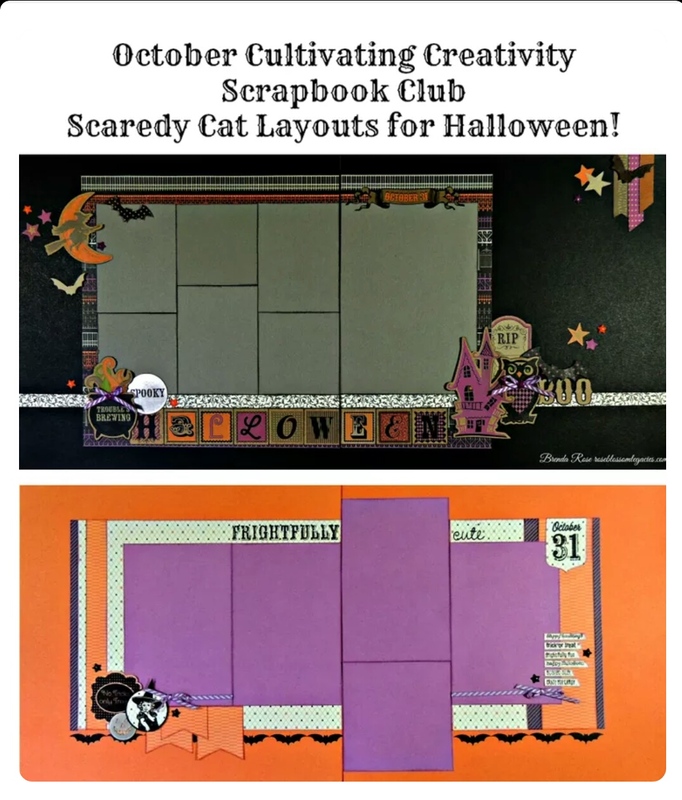 I also used up more (of my ever-expanding) stash of paper scraps to create the grid. There’s a mix of CTMH, SU, MME and Carta Bella. How does this layout inspire you? I challenge you to create a layout about your favorites- music, food, quotes, travel destinations…I’d love to see how you are inspired! I’ll be back again real soon! Thanks for visiting! Phew! Another week begins today! Are you ready? I’ll be away again either late tomorrow or early Tuesday for the night. My Oma’s funeral is Tuesday. I’ll catch you again soon after that! I wanted to share another layout with you today. 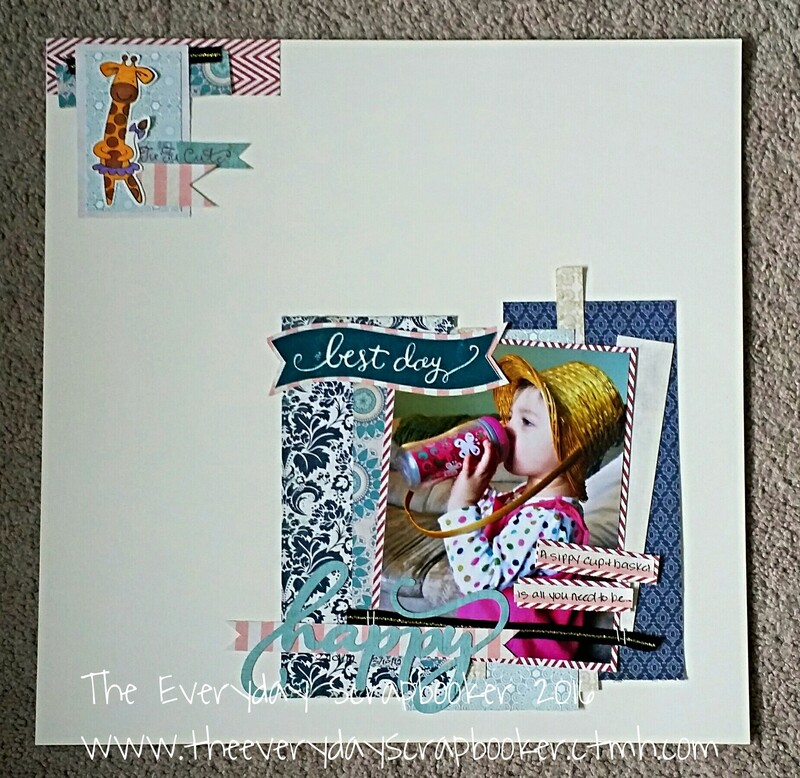 Again, it’s a double page spread, which was inspired by a sketch over st Scrapbook Generation. It was a challenge in their St. Patricks Day crop a few weeks ago. 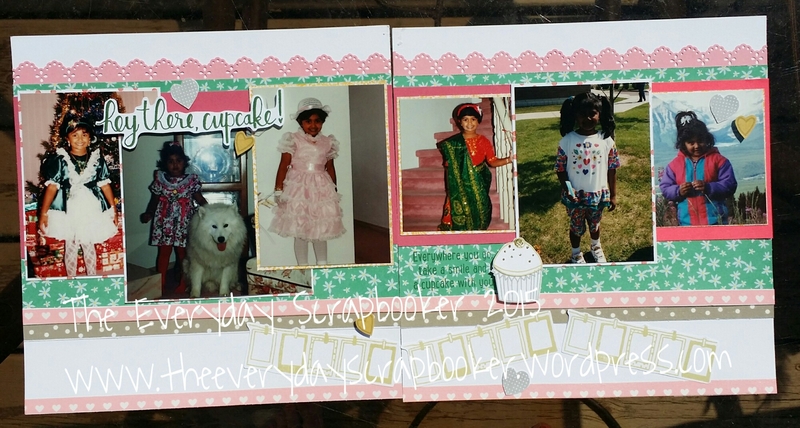 I used a mixture of scraps from my scrap box and journaling cards from miscellaneous paper kits from MME. The floral background was cut with my cricut and the background was created using HS mists. Thanks for dropping by and spending time with me! I’ll be back again real soon! Good morning, friends! We’ve plunged into the deep freeze the last two days, brrr! We’re hunkering down to hibernate today! We had to venture out in the cold weather yesterday, so today we’ll stay in. Hopefully it’ll smarten up for school tomorrow! As with my previous post, this layout was also inspired by a sketch. Find it saved to my Fave Sketches board here. See the blank navy squares? They aren’t supposed to remain empty- I plan to fill them up. Since my girls learned to talk, I’ve recorded the sweet, silly and goofy things they’ve said over the years to my Facebook. Thank goodness for the On This Day app, because those very things I recorded over the years sometimes pop up in my news feed. The plan is to take those quotes and put them in the blank navy boxes. It may take a while, but I’ll eventually get those boxes filled. Patience is key! Once this one is completed, I’ll be creating one of my other daughter. Stay tuned! Good afternoon everyone! I’m sharing another double page spread today. This one is Halloween themed! I absolutely loved working with the original that inspired me- it was easy to lift and my design came together rather quickly on this one! 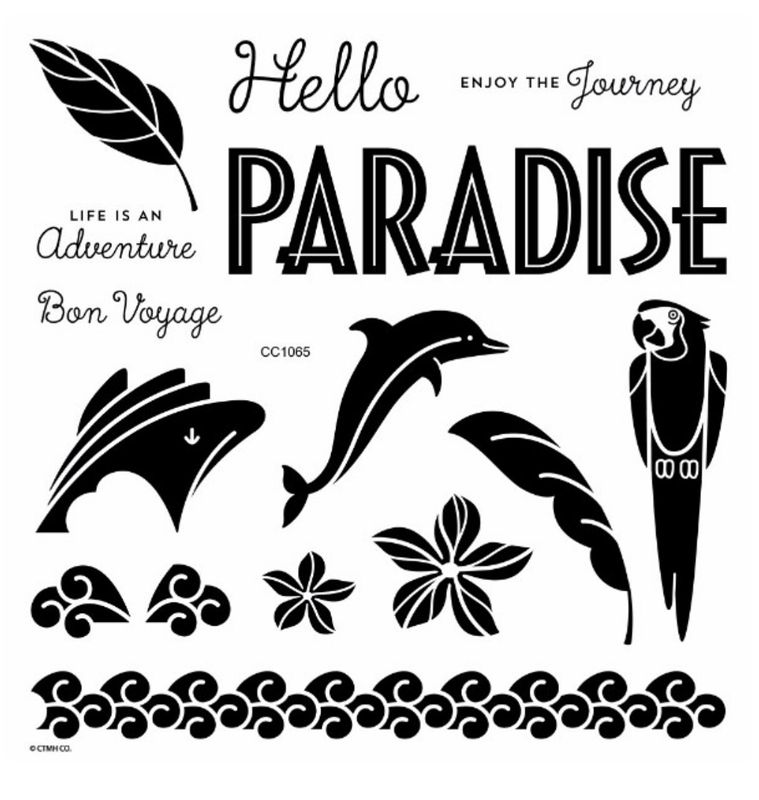 Find the original (and more) saved to my Fave Scraplifts Pinterest board. The layout that inspired me is the bottom one, though the top one is inspiring too! I’m just not ready to use it yet! 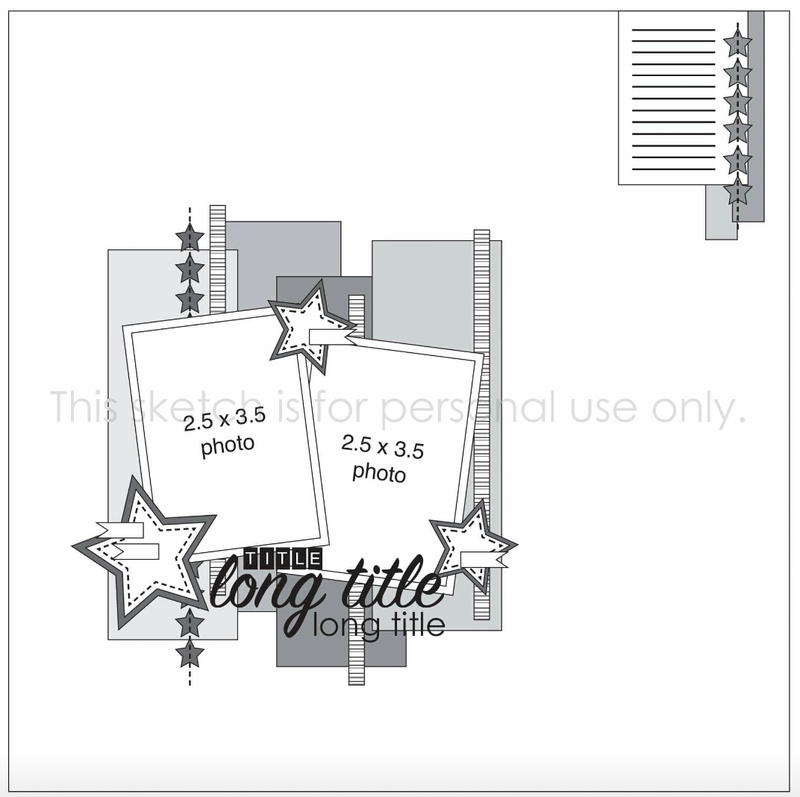 I created this layout using CTMH patterned papers and inks, SU (and a few CTMH) stamps, My Minds Eye washi tape and some embossing folders (which I ran the purple pendants through my cuttlebug with). I hope you enjoyed today’s project. I hope you join me again tomorrow for another layout! Good morning! 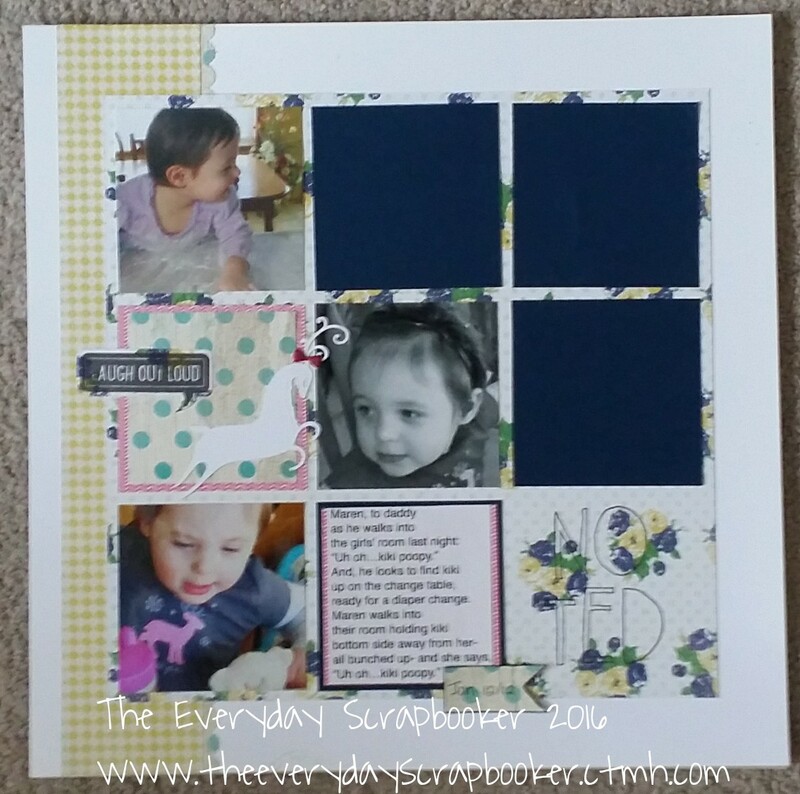 Today, I’m sharing a double page layout. Actually, from here on in, I’ll be sharing mostly double page spreads from my special request album. 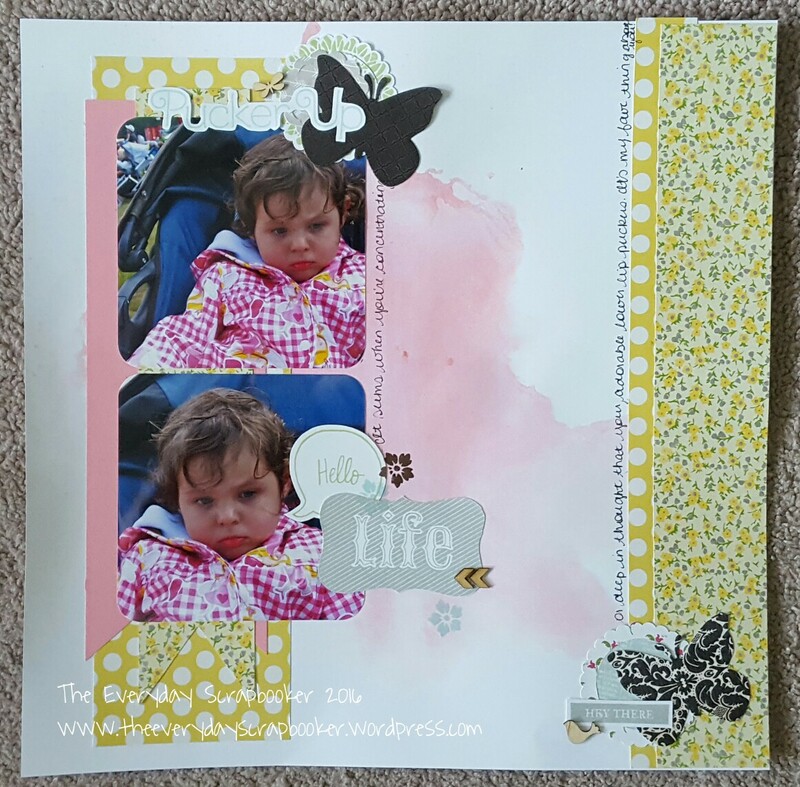 I felt that, in the interest of time and efficiency, double page spreads would work the best to incorporate all the awesome pictures my customer had provided me with! 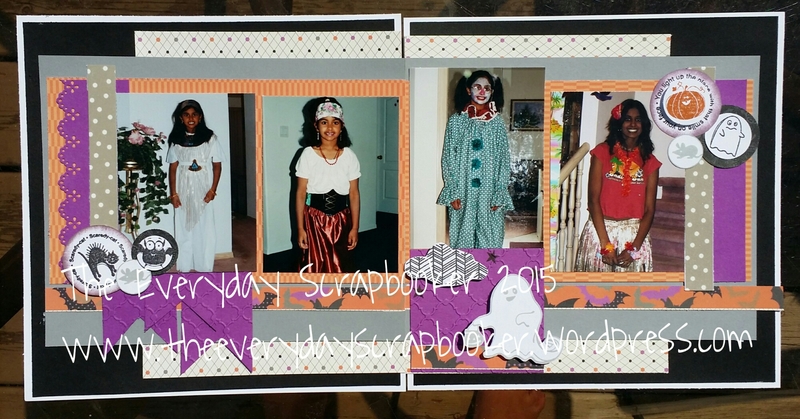 And yes, I wound up using every single picture- with two extra page protectors left to spare! I used a mixture of CTMH products and My Minds Eye washi tape on this spread and trimmed and arranged the pics so they overlapped to ensure everything fit comfortably on each 8×8 page.